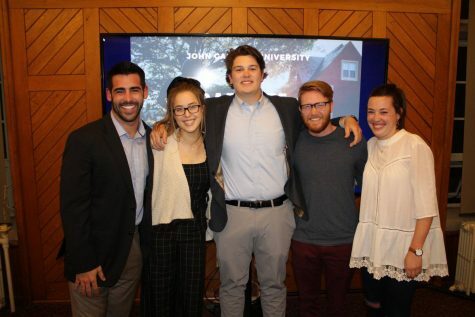 Clare Snape, a senior at John Carroll University studying Communication on the integrated marketing track, has been working hard on a campaign close to her heart. It’s with the Leukemia & Lymphoma Society, or LLS, and it’s part of her nomination for 2019 Collegiate of the Year. The Collegiate of the Year Program of the Leukemia & Lymphoma Society “is a national nonprofit that raises money to do research on blood cancers, so primarily lymphoma and leukemia,” Snape said. The society has chapters throughout the country, including one in Northern Ohio, which covers Cleveland, Akron, Dayton and other cities. Every year, each national chapter has a Man and Woman of the Year, involving a fundraising campaign that professionals in the community can participate in. According to the organization’s website, candidates for the award form fundraising teams and compete in the philanthropic competition in honor of two local children who have survived blood cancer. The title of Man or Woman of the Year goes to the person who raised the most funds through his or her 10-week campaign. There is a winner in each community and a nationally recognized Man or Woman of the Year for the most funds raised in the entire United States. “Northern Ohio is the only chapter that currently does the Collegiate of the Year program,” said Snape. She is one of six college students in the running for the 2019 Collegiate of the Year. Upon accepting the nomination, each candidate has seven weeks to raise the most “votes.” Each dollar donated counts as a vote. The candidate who receives the most votes will be honored with a scholarship as well as the title of the Northern Ohio chapter Collegiate of the Year. This year’s candidates competed for the Boy and Girl of the Year, who are blood cancer survivors Jack and Maja, ages 8 and 5, who represent the many patients that have been helped by the Leukemia & Lymphoma Society. “They’re both currently in remission from leukemia, and have been directly served the Northern Ohio Chapter of LLS through copay assistance, research, transportation reimbursements [and] things along those lines,” explained Snape. The way Snape became involved with this organization is very close to her heart, she explained. Snape’s participation in the campaign has garnered some exciting avenues in public attention, one of which was being mentioned in Forbes Magazine. “They did an article on the program and they listed all the candidates. So my name is in there, and John Carroll’s name as well,” Snape recounted.